Teachers of the Hyderabad Central University belonging to the Scheduled Castes and Scheduled Tribes have announced they will go on a hunger strike from Thursday over the demand for the resignation of the vice chancellor and the in-charge VC in the wake of the suicide by Dalit research scholar Rohith Vemula. Intensifying their protest, students held a demonstration outside the residence of interim VC Vipin Srivastava when he was in a meeting with non-teaching staff. The protesters then marched outside the campus and burnt an effigy of the vice chancellor. Srivastava later visited the protest site to initiate a dialogue, but faced the ire of the students who raised slogans asking him to 'go back'. He was forced to beat a retreat in a few minutes as someone banged his car when it was about to move. 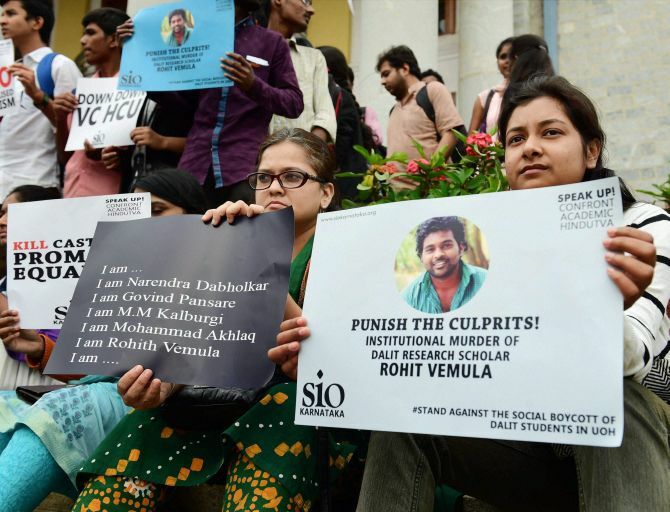 Students of most universities in Andhra Pradesh and Telangana boycotted classes in solidarity with the agitators as they sought ‘justice’ for Rohith, who was found hanging in a hostel room on January 17. The SC and ST Teachers Forum said in a statement that its members would go on a hunger strike from Thursday to press for the resignation of VC Appa Rao and the interim VC ‘in order to resume academic and administrative activities’. Several members of the Forum have already given up their administrative responsibilities in solidarity with the agitating students. "We have been criticised constantly that no one is making an effort. The truth is that police has been stopping me (from venturing out). It is stopping us, Prof Rao (the VC who has gone on leave) as well as me. Because they felt it may result in a law and order situation," said Srivastava. He, however, said that he later convinced police to let him go and talk to the protesting students. Srivastava said he could have stayed longer at the protest site but felt that would serve no purpose. "I could have stayed for longer. But then I did not see any purpose because they were not willing to talk. I thought they wanted somebody to come and talk to them. So I went, but there was no possibility," the in-charge VC said. The selection of Srivastava as interim VC was opposed by the students and SC/ST staff forums as they claimed he headed the Executive Council sub-committee whose decisions were ‘responsible for the death of Rohith’ and that he was one of the accused in the death of another Dalit student in 2008. Meanwhile, in a bid to blunt the attack it has faced over the raging issue, Bharatiya Janata Party’s student outfit Akhil Bharatiya Vidyarthi Parishad has announced a nationwide campaign to highlight its version of events on the campus leading to Vemula’s suicide. We are Brahmins, OBCs, Dalits, Muslims, but are we Indians?